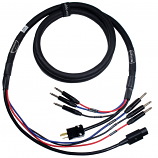 This category features our custom composite cables. They like snake cables only feature various signal cables within the PVC jacket. They are perfect for runs from your amplifier to your pedalboard.